For the song by Eddie Rabbitt, see A World Without Love (Eddie Rabbitt song). "A World Without Love" is a song recorded by the British duo Peter and Gordon and released as their first single in February 1964. It was included on the duo's debut album in the UK, and in the US on an album of the same name. The song was written by Paul McCartney and attributed to Lennon–McCartney. The B-side was "If I Were You", written by Peter and Gordon. In the United Kingdom, the song reached No. 1 on both the Record Retailer chart and the New Musical Express chart. In the United States, "A World Without Love" topped both the Billboard Hot 100 and the Cash Box Top 100. The song also reached No. 1 on the Irish Singles Chart, No. 1 on New Zealand's "Lever Hit Parade", No. 2 in Australia, and No. 8 on Norway's VG-lista. McCartney wrote the song when he was 16. When he moved into the London home of his then-girlfriend Jane Asher in 1963, sharing a room with her brother Peter Asher, Asher asked him if he could use the song after Asher and Gordon Waller had signed a recording contract as Peter and Gordon. McCartney described John Lennon's reaction to the song: "The funny first line always used to please John. 'Please lock me away –' 'Yes, okay.' End of song." Lennon said of the song that "I think that was resurrected from the past. ... I think he had that whole song before the Beatles. ... That has the line 'Please lock me away' that we always used to crack up at." McCartney did not think the song was good enough for The Beatles. As such, the song was never released by the Beatles, and the only known recording of the song by any member of the Beatles is the original demo of the song performed by McCartney, which is now in the possession of Peter Asher. As of January 2013, Paul McCartney's demo has been leaked on YouTube. It is 30 seconds in length, but offers a rare glimpse into the song's origins. The clip was played at Asher's most recent string of concerts. It is one of two songs written by Lennon–McCartney to reach number one in the US by an artist other than the Beatles. The other is "Lucy in the Sky with Diamonds" covered by Elton John. "Bad to Me" written by Lennon and McCartney in 1963 was given to Billy Kramer and reached number 1 in the UK, but it failed to do so in the US. Before giving the song to Peter and Gordon, McCartney offered it to Billy J. Kramer, who rejected it. The song was one of the seven number 1s written by Lennon-McCartney that charted in the US in 1964, an all-time songwriting record for most songs to top the US charts in a calendar year. "A World Without Love" is one of The Rock and Roll Hall of Fame's 500 Songs that Shaped Rock and Roll. A cover version by Bobby Rydell released May 1964 was a strong regional hit in many markets. It reached No. 80 on the U.S. Billboard Hot 100 and No. 2 in a tandem ranking with the Peter and Gordon version on the Cash Box Top 100, before Rydell's name was dropped from the entry. In his native Philadelphia the paired versions reached No. 1, while in the Pittsburgh market Rydell's version reached No. 4 to the exclusion of the Peter and Gordon original. In Chicago, Rydell's version reached No. 10 on the WLS "Silver Dollar Survey", in a tandem ranking with the Peter and Gordon version, while reaching No. 13 independently. Rydell's version also reached No. 5 in Singapore and No. 9 in Hong Kong. ^ a b c d Peter & Gordon - World Without Love, norwegiancharts.com. Retrieved June 4, 2018. ^ Miles 1997, p. 111. ^ Peter & Gordon - If I Were You, norwegiancharts.com. Accessed July 27, 2016. ^ a b Peter and Gordon - Full Official Chart History, Official Charts Company. Accessed July 26, 2016. ^ a b c "Hits of the World", Billboard, May 9, 1964. p. 30. Accessed July 26, 2016. ^ Hot 100 - Peter and Gordon A World Without Love Chart History, Billboard.com. Retrieved June 4, 2018. ^ "Cash Box Top 100", Cash Box, June 27, 1964. p. 4. Accessed July 26, 2016. ^ Song Title Search Results for "World Without Love", The Irish Charts. Accessed July 27, 2016. ^ a b "Lever Hit Parade" 28-May-1964, Flavour of New Zealand. Accessed July 27, 2016. ^ a b Jackson, Andrew Grant (22 April 2013). "The Songs the Beatles Gave Away". Slate. Brow Beat: Slate's Culture Blog. Retrieved 12 May 2013. ^ a b c Miles 1997, p. 112. ^ Sheff 2000, p. 173. ^ "Rare Paul McCartney Recording of 'A World Without Love' Surfaces". Rolling Stone. 18 January 2013. Retrieved 22 March 2014. ^ "A World Without Love – Home Demo by Paul McCartney". YouTube. 23 January 2013. Retrieved 22 March 2014. ^ a b Songs written by John Lennon, MusicVF.com. Accessed July 26, 2016. ^ "Item Display - RPM - Library and Archives Canada". 30 March 2012. ^ "The Irish Charts – Search Results – World Without Love". Irish Singles Chart. Retrieved March 20, 2018. ^ "Cash Box Top 100" (PDF). Cash Box. 27 June 1964. p. 4. Retrieved 20 March 2018. 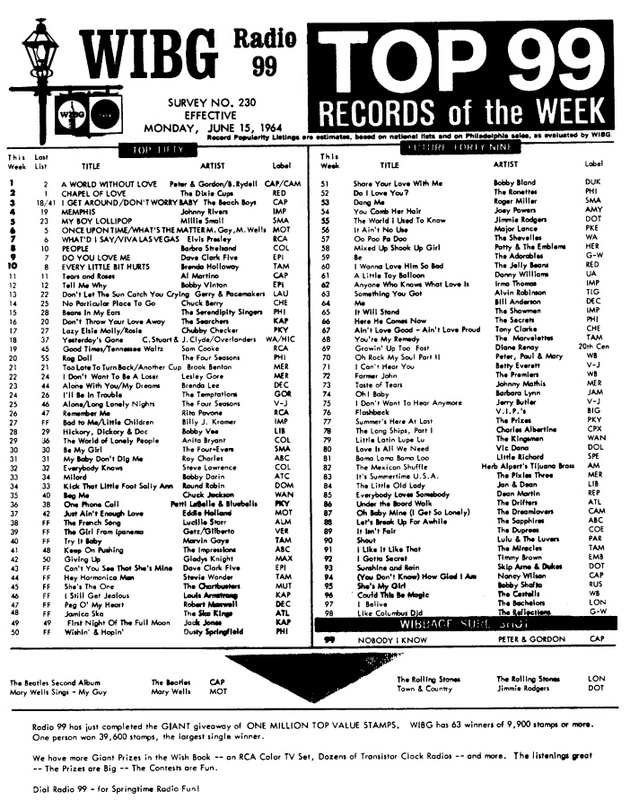 ^ "Top 100 Chart Hits of 1964", Cash Box, December 26, 1964. p. 12. Retrieved March 20, 2018. ^ "Bobby Rydell Hot 100 - A World Without Love Chart History", Billboard.com. Retrieved June 4, 2018. ^ "Cash Box Top 100" (PDF). Cash Box. 13 June 1964. p. 4. Retrieved 4 June 2018. ^ "Top 99 Records of the Week", WIBG Radio 99, Survey No. 230, June 15, 1964. Accessed July 26, 2016. ^ "WLS Silver Dollar Survey", WLS, May 29, 1964. Accessed July 26, 2016. ^ "WLS Silver Dollar Survey", WLS, June 12, 1964. Accessed July 26, 2016. ^ "Hits of the World", Billboard, July 18, 1964. p. 27. Accessed July 26, 2016. ^ "Hits of the World", Billboard, August 8, 1964. p. 39. Accessed July 26, 2016. ^ The Supremes - World Without Love, norwegiancharts.com. Accessed July 27, 2016. ^ "Billboard Hits of the World", Billboard, March 27, 1965. p. 28. Accessed July 27, 2016. ^ "Handy Man – Del Shannon". AllMusic. Retrieved 4 June 2018. ^ "Don't Just Stand There – Patty Duke". AllMusic. Retrieved 4 June 2018. ^ "Only Sixteen – Terry Black". AllMusic. Retrieved 4 June 2018. ^ "Super Colossal Smash Hits of the 90's: The Best of the Mavericks - The Mavericks | Release Info | AllMusic". AllMusic. Retrieved 13 October 2018. Miles, Barry (1997). Paul McCartney: Many Years From Now. New York: Henry Holt & Company. ISBN 978-0-8050-5249-7. Sheff, David (2000). All We Are Saying. St Martin's Griffin. ISBN 978-0-312-25464-3. This page was last edited on 21 November 2018, at 02:37 (UTC).